Diidja was an early bark painter in the Oenpelli region. He only has a few known works because he died before bark painting became commercial. If you have a Diidja bark painting to sell please contact me. If you just want to know what your bark painting is worth to me please feel free to send me a Jpeg. I would love to see it. Diidja painted bark paintings in an archaic style full of power and spirituality. Only a few examples of his work a known but they are so powerful I think he deserves recognition as an important artist. Both barks have irregular edges and have an early collection date. He died before barks were commercially collected in the 1960’s which accounts for why so few of his work exist. Hos barks deal with figures from the spirit world and are on an ochre background with white kaolin figures covered in fine red dots. His work exhibits a freedom and flow that I find highly desirable in a great bark painting. 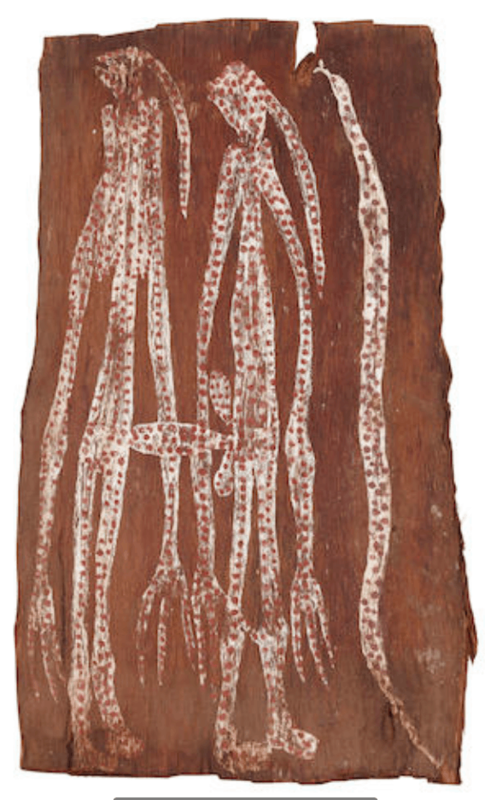 His bark paintings can only really be compared to other very early Oenpelli artists like Najombolmi or Nym Djimurrgurr. Diidja belonged to the Kunwinjku people in Western Arnhem Land and was born around 1900 and died in 1963. 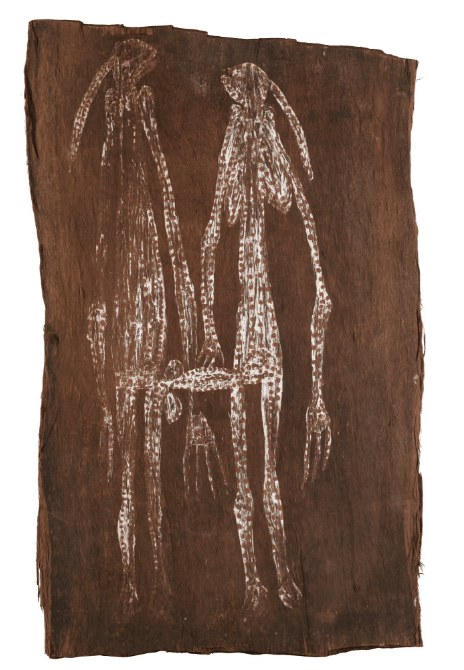 Along with many other Arnhem Land Artists who did bark paintings, there is not a lot of information available about Diidja / Mandidja. If anyone knows more information about the biography of Diidja please contact me as I would like to add it to this article. Diidja is also called Madidja | Mandidi | Mandidaidai.